Yeast and sourdough bread recipes will often tell you to punch down the dough. What does that mean? How do you do it? And, more importantly, why do you do it? Punching down is a common technique used in bread baking and it is essential to almost every bread you bake. Punching down deflates the dough and releases the air so that you can knead it and form it into loaves. It is very easy to do, and there is a very good reason why it is required. You can even choose to punch or fold the dough to create a different texture in your baked loaves. Most bread recipes require two stages of rising (also called proofing). Punching down the dough is done after the first rise and it is a very easy technique. Leave your dough in the bowl it rose in. Make a fist with your hand and push it gently and firmly into the center of the puffy dough. Fold the edges of the dough into the center to form the deflated dough into a ball. Remove the ball from the bowl and place it onto a lightly floured surface. Knead it two to three times before forming your desired shape or placing it into a bread pan. 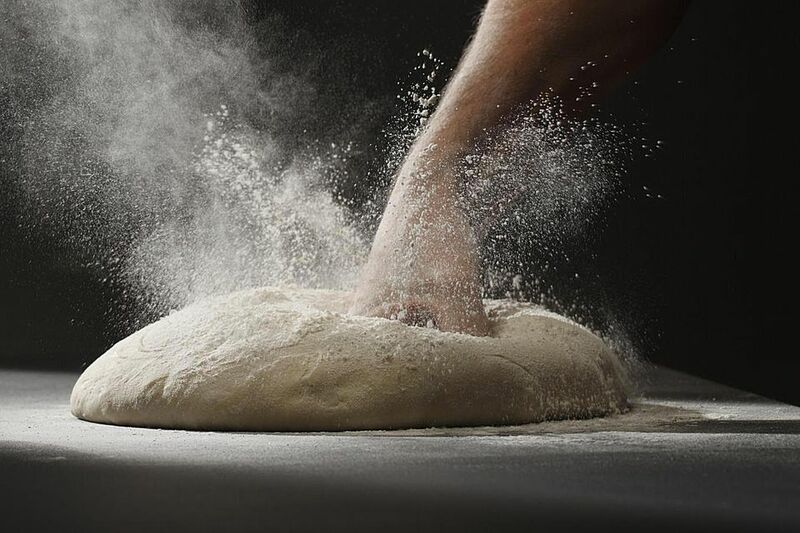 Tip: To relax the gluten and make the dough easier to shape, place a cloth or bowl over it and allow it to rest for 10 to 15 minutes after punching. Some bread doughs are more elastic than others and if you find a recipe that is difficult to form into the shape you want, this trick may help. Why Do You Punch Down the Dough? Punching is an extremely important step in making bread. As the dough rises, many tiny air pockets are formed inside. The goal of punching is to reduce and remove these gasses and bring the yeast, sugars, and moisture back into one cohesive form. The yeast cells are redistributed and form a closer bond with the sugar and moisture to help fermentation and improve the second rise. The yeast gets new starches and sugars to eat during the second rising, in turn, this improves the bread's flavor. The more air pockets you can remove from the dough, the finer the grain (or crumb) will be. For the majority of bread recipes, you will punch down the dough and give it a simple folding step. However, some bread recipes may ask you to do one or the other and it does make a difference in the final bread. Finer crumb and bread texture: The harder you punch the dough, the finer crumb and texture your bread will have when baked. This is because you are removing more of the air pockets with more force. Punching works great for sandwich bread, sweet rolls, and any type of bread where a tighter grain is desired. Large air pockets: If you only fold the dough, you will leave large air pockets in the baked loaf. This creates a looser crumb and the bread will rise higher while baking. It is great for making airy, rustic styles of bread, fluffy dinner rolls, and loaves of bread like baguettes in which large holes are desired. By using a combination of punching and folding, you get a happy medium between the two. That is why many of your basic bread recipes will suggest both or note a general punch down in the instructions. As an experiment, bake two identical loaves of basic white bread and use one technique exclusively for each. It is a great way to see (and taste) the effects of the punch versus the fold.